The idea of all inclusive resorts is that you never have to leave the hotel and spend all your money there. Therefore if you are staying at an all-inclusive, your nightly entertainment is already provided. Many hotels have shows similar to those of Las Vegas or on cruise lines. Some hotels issue night passes for non-guest but they don’t really advertise this very much as it can be difficult to keep track of guests at night. Finding what is going on elsewhere than in your hotel might not be easy as receptionists are trained to keep you in the complex. Bávaro complex is probably your all-around best bet if you are trying to find entertainment away from your hotel. 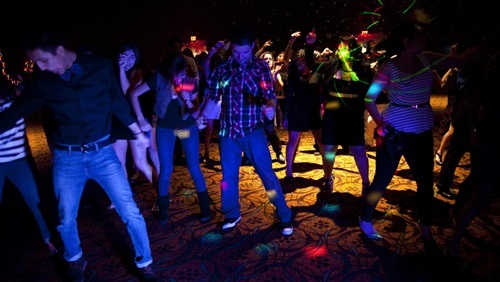 In Punta Cana the nightlife begins just before midnight. This is when people finish their dinner and start to think about entertainment. Popular local music is Merengue. The dress code is typically such that you cannot wear shorts, sandals or sleeveless T-shirts. Smoking is prohibited inside of the clubs.